Perhaps more journalistic than fine art. 'Trash' is a documentation of the litter and refuse that is found in all the locations I travel to. I try to pick up and remove whenever I am able to better the environment and recreation for all. 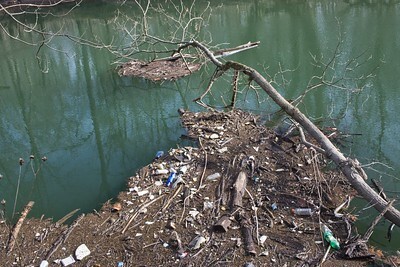 Narrows Reserve, Beavercreek, Ohio "Conservation is life.” - Kedar Dhepe March 18th is Global Recycling Day. This is a bit different departure from the rest of my portfolio. As mentioned in the bio on my website: "Reflected in my work is a deep ecological concern for the fragile and precious environments on our planet. However, I tend to focus on what beauty is already there rather than the harrowing consequences of humanity's actions that might affect tomorrow." Essentially, I took this image a couple years ago to document a few bottles I found collected at the edge of the Little Miami River. This obviously wasn't the only spot..it was all along it. Fortunately there are organizations like the Little Miami Kleeners who solve this problem. Compositionally, this isn't a spectacular photo, but it is more photojournalistic in nature rather than artful. Someday this may be graced in a photo book, who knows. That's an idea I look to explore more of. If you've been following my work for a while. You can clearly tell there's an absence of the human element in my work. This is perhaps intentional although not exactly something I avoid. I tend to leave the viewer to "fill in the blanks." Is it incomplete? I don't believe so, but you decide. © 2017 Ryan L. Taylor Photography. All Rights Reserved.